BodyTalk can be used with humans or animals and can be done in-person, or surrogately, or remotely (distance healing). A friend of mine said he’s had amazing results for himself after a few sessions. But I was really interested in how it works with horses, dogs, cats and other animals. BodyTalk is one of those therapies with a complex charting system, so even practitioners can find it hard to describe succinctly exactly WHAT it is. “Body Talk is a holistic therapy that involves the practitioner tuning into the client’s energy field. The traditional way it’s done uses muscle testing and questions. By asking the body’s innate wisdom what it needs, the practitioner can help the client feel better on a physical, emotional and spiritual level depending on what the client needs. The practitioner often keeps track of the session by writing down notes and linking them together to keep the issues focused in her mind. When the innate wisdom indicates that no further linking is needed, the practitioner will tap the head and heart to co-ordinate healing within the body. Tapping the head commits the instructions to the head and tapping the heart allows those instructions to be circulated by the heart to all the parts of the body. 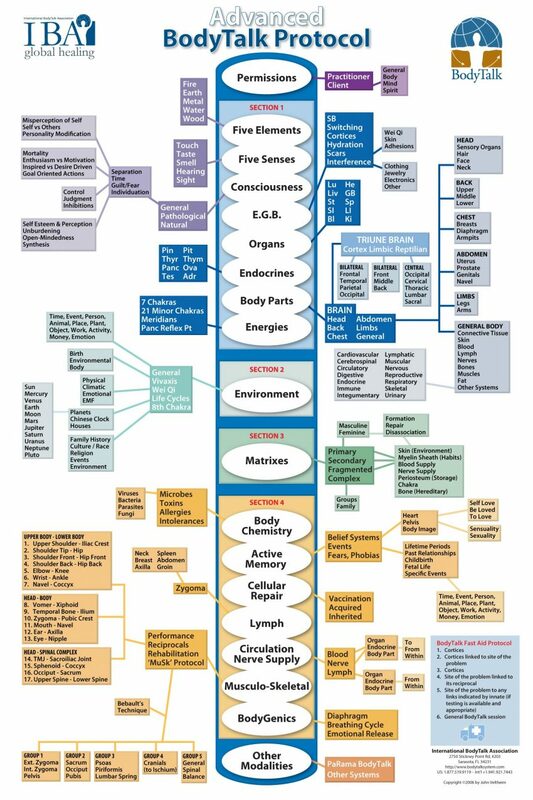 The Body Talk System combines different modalities of healing including Traditional Chinese Medicine, anatomy, and physiology, energy systems such as chakras and meridians, knowledge of microbes, environmental factors, DNA, traumatic events, astrology and families as well as other groups of people that may impact the individual. There are 9 levels for the advanced certification, with more available to help practitioners continue learning and growing. I really like Simi’s explanation, because she recognizes that the practitioner (and their strengths and preferences) are definitely part of the session. I felt led to book a session with Güliz (pronounced geuw-liz – her name is Turkish) for our cat Stitch. 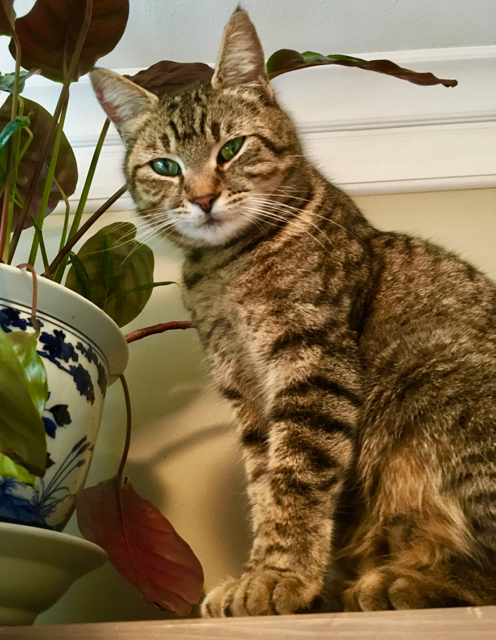 She and her sister were chosen by my children from a feral litter on a friend’s farm who were getting eaten one-by-one. My eldest son chose Stitch and she very quickly bonded to both him and me. 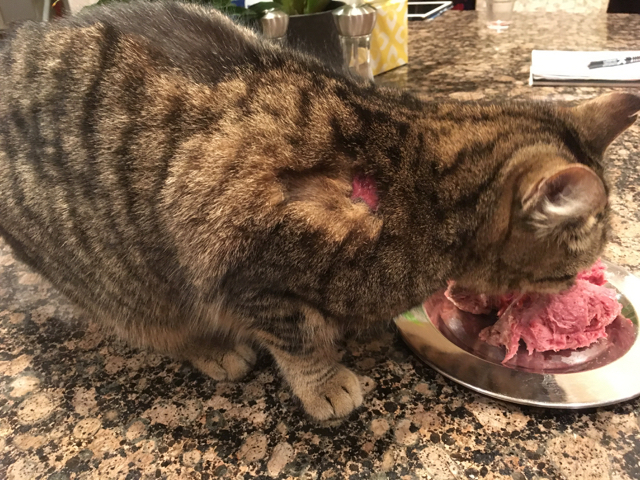 About three years ago Stitch came home with an entire strip torn off her back – down to raw flesh. We surmised that she had gotten into a fight with one of raccoons that lived in our yard and the neighbours’ yard; a mother with 4 young ones. When I connected with Stitch, I got an image of things crawling in her bloodstream, under her flesh. So I gave her 2, 2-week courses of oral wild oregano oil. Yes, you must be very careful dosing cats with essential oils and many herbalists/vets say you should never do it. However, I have used it numerous times on cats, dogs and horses – always listening to the animal’s body wisdom – with only positive effects. Except nothing changed for Stitch. Yes, I can. So I left her alone for about 5 months and then had the idea to book her with a vet who does acupuncture and homeopathics. At $200 per visit, I told Stitch she gets one kick at that can! The acupuncture improved things (less heat on her back, lessening of wounding for a while – although hard to tell as this is cyclical anyway), but nothing significant. Another 4 months passed – where I just left her alone and loved her. Keep in mind that aside from this wounding, she is perfectly fine and healthy in every other aspect. Then I felt moved to book a session for her with Güliz. 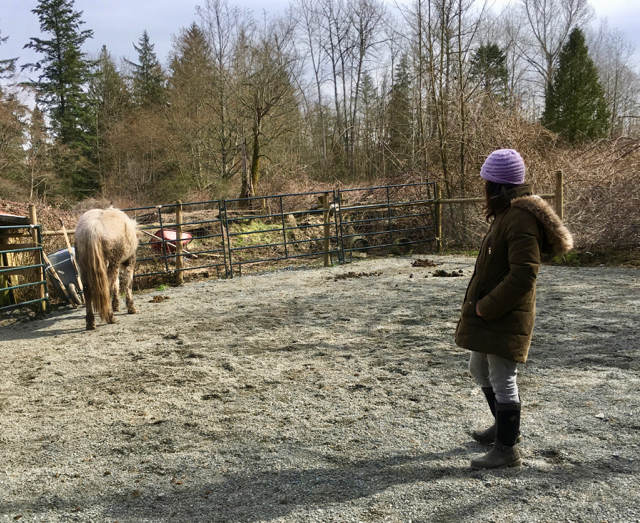 I had been wanting to experience BodyTalk anyway, and none of my horses had any need for it (Güliz works a lot with horses) so this was the ideal opportunity. Stitch during the session with Güliz – the door is open and she can leave at any time, but she stays. BodyTalk can appear like a whole lot of unintelligible mumbling and hand movements as the practitioner runs through charts of physical, energetic and emotional factors that are all linked and cross-linked. As you can see from the chart below – there is a lot to run through. There. Is that complicated enough for you? I have to say – as someone who healed myself of a supposedly incurable disease – that over the course of my Healing Journey I visited many practitioners who were utilizing complex, cross-linked, multi-layered systems like this (all called different names) and I have to say that none of them stood out as being particularly effective – or more effective than any other. What I found does make a difference is the quality and sentience (ability to feel and perceive) of the practitioner. So what I always try to look for is someone who has a heart for healing; I look for people with multiple healing modalities in their toolbox. In my experience, healing is rarely a mapped out chart. It is a full-color painting, or a complex, woven tapestry. The good healers understand this and their thirst for fluency as an artist or weaver of healer is unending. Like EFT Tapping, BodyTalk can be done surrogately for an animal, or for remote/distance healing. So would I use BodyTalk on it’s own? No. It is too regimented and systemized for me. It also relies heavily on Applied Kinesiology (muscle testing), of which there are clinical trials showing it is useful, and others showing it is unreliable. My own experience with Applied Kinesiology is that the practitioner’s intent (beliefs etc.) can easily enter that feedback loop, so unless the person using it is aware of the energetic transfer, and skilled at removing or blocking their own stuff, then it can be inaccurate. Güliz received information that Stitch was feeling guilty over the raccoon, that they were actually friends and the raccoon hurt her by mistake. And the raccoon also feels bad. This actually makes sense, because I remembered marveling that the cats did not run away from the raccoons and would often run after them, ducking under a hole in the fence to follow them. So then Güliz had a process to bring the raccoon in for healing too. After the session, Stitch disappeared for two days and we wondered if she’d gone to find her friend – the raccoons left our yard when our dog Tiah arrived. 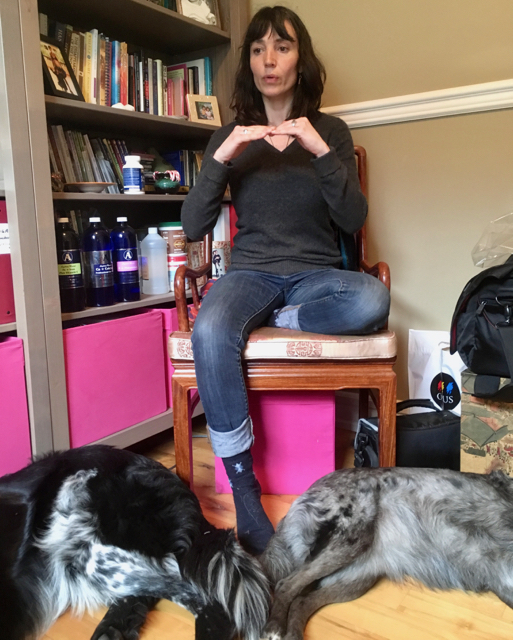 Right at the beginning of the session, as Güliz tuned into Stitch and began the BodyTalk process, she said what was coming from Stitch – but also from the greater animal kingdom – was a desire for witness. To have the story realized; there is something in the animal world spirit that wants to come out. I grabbed a small spiral notebook and a pen embossed with Listen To Your Freedom (the name of my biz program) as I felt that was particularly fitting. And as I placed them there I had a sneaking suspicion as to what would come next. Sure enough, the next day Stitch fixed me with her intense green laser stare and I knew she wanted me to record her words on paper. “I love life. Life is really exquisite. Sometimes it gets complicated, but when my paws touch the good green earth, all is right again. 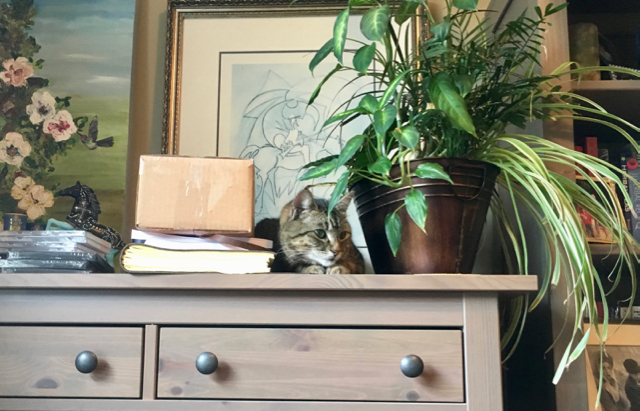 I am a medicine cat – this means I can transmute energy. All you have to do is ask. I am listening always. I have lived many lifetimes. I am wise. I am a sage. I have lived in many forms; energetic and physical. Then Stitch asked me to read back to her out loud what I’d written down. I felt this as a sacred request – something of tremendous gravity and importance to her. As I began to read, the power in the room was palpable and almost made me dizzy; like right on the edge of dizziness. As I read, she continued to stare intently at me from her perch atop my bookshelves. 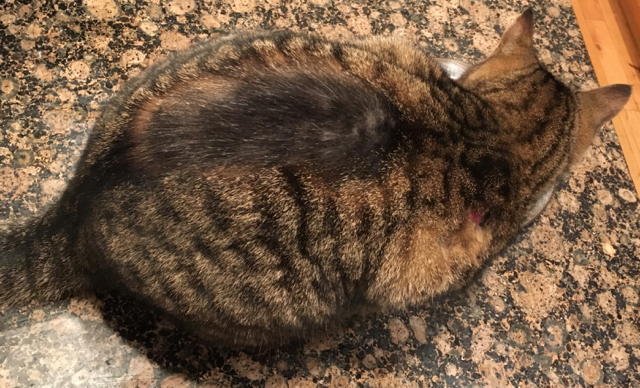 Then half-closed her eyes – the way cats do – and rested her head on her paws. We just exchanged love for a while and then I turned back to my work. The next day I was again working at my desk. Stitch had come in (through the dog door) during the night and was once again sleeping on her perch. I must have felt her gaze on me, because I swiveled my chair around and she was staring intently at me. Oh my gosh – again? Is this going to be a daily occurrence? The thing I find hilarious is that I do not write poetry! Yet both Stitch and my Andalusian mare Zorra have dictated poems to me (and others). It kinda makes me chuckle. The other interesting thing I just noticed – after re-reading these a few times – is how many times she uses the word green, which is the color of her eyes. And so, we continue on this journey – that may, or may not, result in the physical healing of Stitch’s recurring wounds. If not, it’s because there is more to learn, more to be revealed. At all times, I find it useful to ask myself: The body is speaking; what is it saying? Güliz came out to my barn to do the follow-up session with Stitch and she said the only thing coming up was “Kesia” which mystified Güliz. But she has been doing this work long enough to not question seemingly bizarre bits of information! Güliz has never met Kesia – she has just connected with her through this blog. I, of course, instantly knew what it meant and emailed Kesia that Stitch wanted to dictate something to her. Perhaps, like Zorra, Stitch will give her a song… or a poem, or?? And so I shall leave you with a direct experience of BodyTalk – you can follow along as BodyTalk founder, Dr. John Veltheim, demonstrates The Cortices Technique. If you have hit your head recently, or experience dizziness, brain fog, headaches, etc. this technique is fabulous and I felt the difference immediately. I changed it a little bit, by tapping longer (7 taps each) on the head and heart and then by switching hands and doing the whole sequence again – because that felt better for me. The video description says: The brain is the core of the human body it controls the way the body communicates with all it’s various parts. This in turn controls our amazing healing abilities. When the brain’s function is compromised the body cannot properly heal. The Cortices Technique allows for increased brain function and connectivity between all the parts of the body. Since the body communicates using electricity and quantum energy this technique has an amazing effect on the body by allowing the body to reconnect broken or overloaded circuits. The technique has been demonstrated by EMS Response teams to bring trauma patients out of shock when at the scene of accidents. The basic ideal is to hold the point of injury and to perform the technique on the patient. This has the effect of allowing the body to address the injury and to do what is necessary. In the case of a trauma victim they could be bleeding to death and the brain is so overloaded that it doesn’t send the healing instructions to clot the blood. The victim then dies due to the fact that the body can’t respond. By performing the Cortices Technique on the patient the brain is able to address the problem and allow the body to engage in the healing crisis and to clot the blood. Dr. Veltheim recommends that in this day and age where we have so much electromagnetic radiation, that this technique can be performed twice a day for 2 or 3 months as a general maintenance routine. The person performing the technique will notice many changes in their body due the increased ability of the brain to deal with the daily stresses of life. If you have any questions for Güliz, just leave them below. Or come on out to the Healing With Horse Symposium in Arizona next month, as both Güliz and I are presenting some juicy stuff there! Great article, Jini. Chiron, one of my two feline familars, dashed into the room when I opened this article. He purred so hard that he couldn’t contain his drool while I read it. Then he popped into my lap, where he’s continuing his hyper-enthusiastic purr job. I haven’t seen him this turned on since I last roasted a turkey, which was years ago. As critter-communication validation goes, I’ve rarely seen one more screamingly obvious. I place a lot of stock in critters’ responses to healing modalities. We adult humans often have complex relationships with our health issues. Our beliefs play a huge part in what works and what doesn’t for us. Critters and kids have more direct pipelines to their healthy states. If a technique works on a critter or child, I’m fairly confident that there’s authentic healing going on. Adult complicate matters with our expectations and projections. I was taken with Stitch’s description of her friendship with the raccoons. I see that with my cats too. Unless they invade the house, where their food bowls live, my cats get along comfortably with the local raccoons and skunks. At dawn, I often see Ariel, the cat, and a local skunk hunting out in the backyard a few yards from one another. Chi can usually be found stretched out on a glass table, apparently acting as their sentry. I haven’t met a domestic critter yet who didn’t enjoy cross-species communion. Mine have always cultivated relationships with the wildlife with whom they share territories. As strongly bonded to the equine realm as I am, I thoroughly appreciate ventures into the realms of other species. In my view, the healing lives somewhere in our interconnectivity. I’ve never been to a well-run barnyard that wasn’t bursting with cross-species interactions. The cats keep the rodent populations in balance. Geese are often about to help them with the snakes. Chickens keep down the insect population and the dogs fend off the smaller predators, like raccoons, foxes and bobcats. Life wants to be a complex, cross-stitched pattern. Our human efforts to isolate out the operant variables in our problems, so we can laser in on a fix, sometimes just throws us further from our center of gravity. Pharmaceuticals are an example of this. When we invade the biochemistry of plants to mine one molecule, we lose the entourage effect of all its other elements.. They’re there for a reason, or twelve. Study after study shows the folly of this, yet we persist. Sigh. The stubbornness of our health care industry cracks open the door for our ancient methodologies to slip back in. That’s a good thing. Thank you for being such an effective conduit. That is SO COOL with your cat, Pat! (as is that little rhyme har-har). AND as I was reading your comment, Stitch came in my office and peered at me intensely and kept engaging me until I realized, oh yes, she is also VERY pleased that her story is out there! And yes, I agree with you about kids and animals being a litmus test for therapies – it was actually Audelina’s response to flower essences that started me using them myself. I just want to CELEBRATE another day of living,!!! I love this amzng life of connecting in Love, with all these Beings who are here on Earth to em-body Love, in all of its vast and expanding intelligence, in so many forms.! Knowing /experiencing/be-ing the mystic-self as cat, as horse, as trees or stones, as poetry, as human, as absolutely everything in creation, is the only reason I , as human, want to stick around on this planet. This is the stuff my dreams are made of… I know a Cosmic Cat named Tommy, who downloads multi-dimensional /quantum awarenesses/experiences into me. (also dictates poetry to his human beloved!) Thank you, all of you, Jini, Guliz, Stitch, racoon, Kesia, god, cosmos…I am overflowing, with hope. and love. especially love. xxoxoxo sheila, girl, and all of us at LaLa Land Farm. Love you all. ! Jini, wanted to tell you my cat/raccoon story. I used to be a waitress at a restaurant on the Sacramento River. There were a couple of crazy cat ladies ..(I say that lovingly) that worked with me and they always fed the stray cats and I even helped try and catch a lot of them to help get them spayed/neutered. The unfortunate situation was that there was still a lot of inbreeding and a lot of sick kittens being born all the time. Every time we would finally catch an spay a mama cat someone would drop off and abandon one or another stray would wonder in. The cat food bowl was placed in a spot where it was visible from a big picture window inside the restaurant from some back tables not facing the river. It always attracted a ton of cats & raccoons. Some of the regulars liked those seats watching the cats and raccoons especially when there were babies. The thing that fascinated everyone including me was that they would always share the food. The cats would usually always give space to the raccoons but I never saw any aggression between them. I feel because there was always an abundance of food it left competition out of the equation. One time there was a particularly sickly litter born and there were two of the blind kittens just sitting in the large food bowl. When the very big raccoon came those of us who were watching thought that those kittens are done for. That did not happen, the raccoon was so gentle with the kittens, even though they kept trying to move around the bowl to engage with the raccoon. They were nuzzling and pawing at the raccoon. It was really amazing to see how the raccoon handled the situation. It just kept moving aside and never was even the slightest bit ugly towards them . All the customers who use to witness the cat/raccoon dynamic were always shocked by how well behaved the raccoons always were even with the adult cats. I know this might not be common place for these two species to get along so well but it definitely had a positive impact on all who witnessed it down on the river. I love when animal species that are suppose to be at odds find harmony with each other it gives me hope for our human species. ✌?️❤️? LOVE this story Michelle – I’m beginning to think there is a whole lot more harmony in the animal world than we have been taught. I love stories like this that are a reminder to act/interact with each animal as a unique being, not a preconceived collection of stereotypes gathered from children’s books and ‘nature’ shows. I also love the way this relationship radiated love/hope out to all who witnessed. Very special and thanks so much for sharing.